"This recipe comes from the mortician's side of the family. I was wary at first because I had never heard of the combination of peaches and blueberries. I was quickly swayed after trying it and now believe that this is one of the best pies ever!" Preheat oven to 425 degrees F (220 degrees C). Place one pie crust into a pie plate. 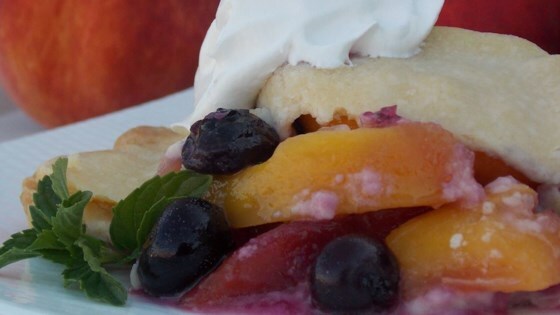 Toss peaches and blueberries in a bowl with lemon juice. Mix sugar, tapioca, and salt in a small bowl and add to peach mixture; stir to combine. Allow fruit to rest for 15 minutes, then transfer to prepared pie plate. Scatter margarine pieces over fruit and brush the edge of the pie with water. Cover pie with remaining crust; press and seal the top and bottom crusts. Bake in preheated oven until crust is golden brown and fruit is bubbly 45 to 50 minutes. Nice combination of fruit, but I wish there was something other than tapioca that could be used to thicken it. It's odd to see little tapioca pearls in the middle of a fruit pie. Make sure that you are using quick-cooking tapioca. The pie is done when it bubbles through the slits in the top crust. Follow this rule rather than a strict baking time. Love this pie! Such a yummy combination.